February 3, 2015 — Early in 1980, Operation USA (then called Operation California) was just finding its footing in the nonprofit sector. Just six months earlier, a friend and I had been inspired to launch our flagship relief effort aimed at providing relief to the Vietnamese “Boat People” refugees in Malaysia. As we gained momentum in the US at the start of the new year, thanks in large part to the involvement of founding board member Julie Andrews, we saw an opportunity to host a television special to raise funds for our cause–and “Because We Care” was born. 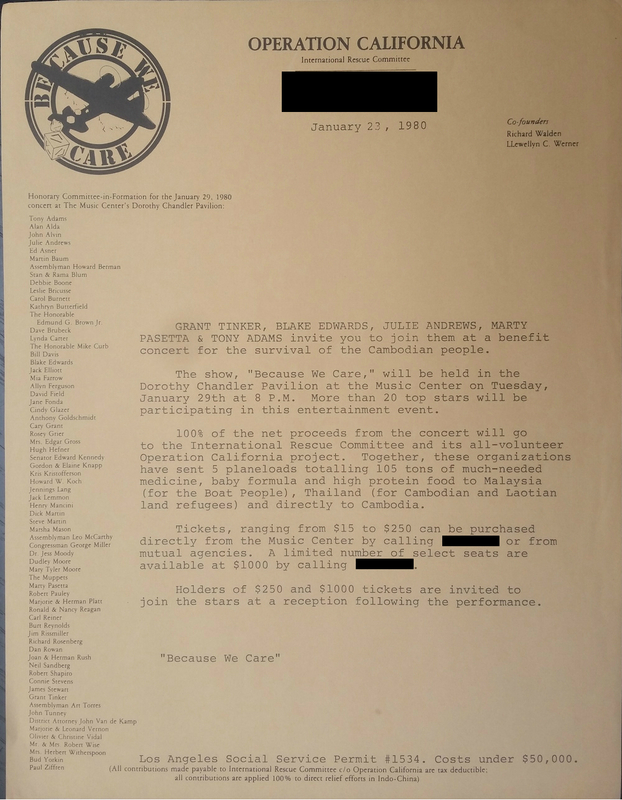 Filmed on January 29, 1980 at the Dorothy Chandler Pavilion in Los Angeles, “Because We Care” aired on February 5, 1980 as a 2-hour special event on CBS and featured numerous celebrities who had a passionate interest in aiding famine victims in Cambodia. Funds were generated by selling tickets to the taping of the special and by public donations made during a phone-a-thon when the concert aired on television. Over $1.1 million was raised to aid Operation USA’s relief efforts, sending medicine, food and supplies to southeast Asia. 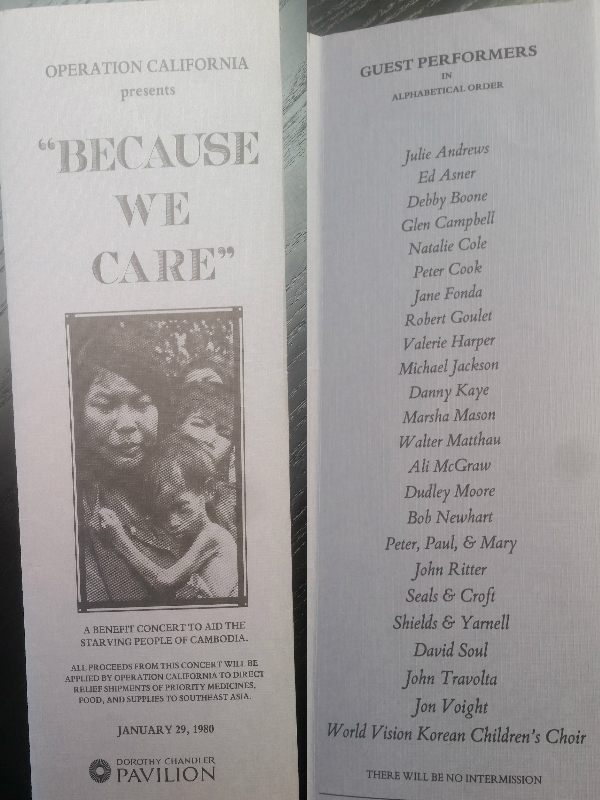 Looking back on “Because We Care” now, 35 years later, I am still proud of the celebrity talent we were able to bring on board as part of our fundraising effort, and am grateful for all the help and support we had in putting the event together. To this day, the special remains one of our most successful fundraising efforts ever, and the money we raised made such a meaningful impact on those people suffering in Cambodia at that time. With the rise of the internet and social media, celebrities now have an endless supply of platforms on which to call attention to causes like ours, and the fundraising landscape has changed quite a bit. But, I will always remember that special day when superstars like Julie Andrews, Michael Jackson, Jane Fonda, Ed Asner, Natalie Cole, John Travolta, Bob Newhart and many more all came together for the television special in support of Operation USA, ultimately leading to 35 years of successful humanitarian aid worldwide. To donate to Operation USA’s ongoing relief and recovery work, visit give.opusa.org.